Your favorite marvelous companions are back! 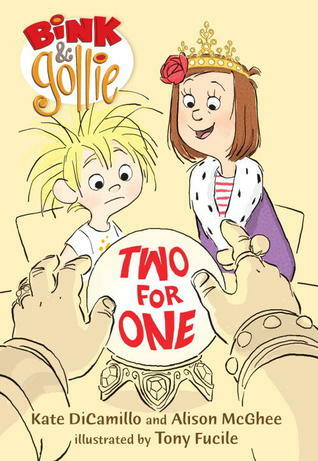 Meet them at the fair in this delightfully droll sequel to the Theodor Seuss Geisel Award-winning Bink and Gollie. The state fair is in town, and now Bink and Gollie - utter opposites and best friends extraordinaire - must use teamwork and their gray matter while navigating its many wonders. Will the energetic Bink win the world's largest donut in the Whack-a-Duck game? Will the artistic Gollie wow the crowd in the talent show? As the undaunted duo steps into the mysterious tent of fortune-teller Madame Prunely, one prediction is crystal clear: this unlikely pair will always be the closest of pals. Get ready for more laughs in this wry, warmhearted sequel to the New York Times Book Review Best Illustrated Book Bink and Gollie, written by the award-winning, best-selling Kate DiCamillo and Alison McGhee and featuring the exuberant visual humor of illustrator Tony Fucile. I am a huge fan of Bink & Gollie. Not only are the two adorable as characters, but the stories are hilarious. I laughed my way through this book. It amazes me when an author (authors in this case) can create such fun stories using so few words. This is a great gift, one that Kate DiCamillo and Alison McGhee share with readers in this series. Bink is so delightfully enthusiastic about pretty much everything while Gollie provides a calming more serious element to the story. Above all these girls are friends. I think that is ultimately what these stories are about: friendship. In the first story, Bink attempts to win a carnival game (challenging to say the least). Unfortunately, her attempts aren't exactly successful (but painfully hilarious) but Gollie proves herself a true friend. Bink returns the favor when Gollie enters the talent show. And the visit to the fortune teller? Well, I'll leave that for you to discover. Just know that if you are looking for sweet stories to share and enjoy that have great themes and characters, look no further than this series. 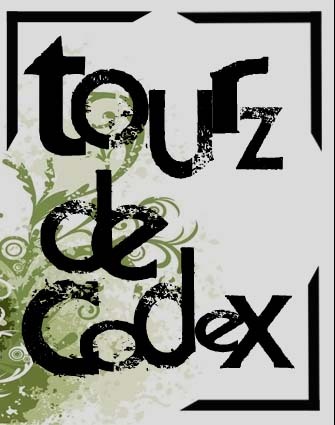 Copy received from Tourz de Codex for blog tour. Usher Vance and his best friend, Calvador, return to their village from an afternoon swim only to be trapped in a tree by a pack of wolves. While they wait for the wolves to leave, they are forced to watch in horror as their village is wiped out by a group of Picts led by a man in black. As they set off hoping to rescue Cal's sister and the other children that have been taken, both boys realize their lives will never be the same. Fortunately, the end up with an old warrior named Meryn who takes the boys under his wings and helps them on their quest. But they are all surprised when their simple quest leads them to play bigger roles in Britain's future than they could have ever imagined. Full of mystery and action this book is a great read for those who like a fascinating story about the history of a nation. I'm not sure what I was expecting when I sat down to read this, but I was pleasantly surprised by the intensity and the great characters. Usher and Cal won me over immediately as did Meryn. Their courage and determination in the face of tragedy was admirable. I also found the book hard to put down, the action was almost continuous as Usher and his friends tended to go from one crisis to the next. There was lots of fighting, the war kind, which was not only intense but kind of sickening, like war really is. This book won't work for those who have problems with war violence. But the story itself is awesome but not necessarily a happy one. Of course, war doesn't usually end happily, the costs are so high for all involved. And sometimes, as Usher discovers, country comes before personal desires. I found the flashback format interesting. The story beings with Usher as an old man telling a made-up story to a group of villagers. Then his old friend Cal shows up and urges him to tell the story of his own life. As he does so, his current life circumstances become intertwined with his past. I found it fascinating the way the two came together at the end. I'd recommend this book to readers who enjoy an action-packed story with lots of interesting characters, both good and bad. Note: There is quite a bit of war violence involved in this story. Tell us about yourself and your home. My name is Uther Pendragon and my home is in the wild lands of Britain; a rich, green and fertile lands of rolling fields and dense forests. At this time in my life I am king to the tribes of Britain and mine is a weighty task. The Romans governed these lands for nearly four hundred years and then left to defend a crumbling empire.... the tribes of Britain were leaderless. For reasons you may read about, I have been made king. Although by birth I was born to rule, I was completely unprepared...Knowing the tribes of Britain were unprotected and unprepared, invaders have been arriving at our coast; Saxons, Jutes and Angles on Viking raids. I love this land and have fought hard to unite the tribes and defend our land. Tell us about your friends and/or family? My parents and I lived in a conical hut constructed with wood from the forest with a roof of thatch. When a new hut is needed in the village, the men construct it together; I like helping with that, it’s a very festive time as everybody comes together to help. The only hut that isn't round in the village is the hut owned by the elder, he is called the Reeve and his hut is larger and square in shape. All village meetings are held in his hut. All the huts are very smoky inside as the fire that burns in the centre, that warms us and upon which in our hut my mother cooked our food, has no escape but the hole in the centre of the thatch; sometimes it takes a long time for the smoke to find the hole! The smoke does keep the ticks and bugs to a minimum, but when it smokes badly it makes life in the hut difficult, I always preferred to be in the forest with Cal trapping rabbits or better still, chancing across a young deer. Summers were a time of plenty with good game and many different fruits and vegetables to be found, we even made bread from small fields of corn, oats and barley that the villagers farm. Winters were long, cold and often hungry times, especially if the mice had spoilt the stored crops. I hated it most when it rained for days and days and everything became slick with the mud and soaked through so that we steamed in front of the fire which was never allowed to go out. If you'd had a choice, how would you have chosen to spend your life? My life changed the evening the wolves came to our village. Maybe if they hadn't come I would have died, maybe I would have grown up there, taken a wife and lived as an Isceni rather than leader of all the tribes. Would I have chosen that life if I could? I don't know, but we get no choice in the direction of our lives. My people believe that the spirits guide us and that there is reason behind everything that happens; however sometimes that reason is hard to find. If I could choose to have spent a life of peace then I would certainly do so, what man would not? If I could choose that the Saxons never visited our shores, that the Picts stayed behind their northern wall and that Cal and I could grow old as friends in the village, then I would. But then if I had led that life I would never have met Merlin, my friend and councillor (he is one crazy old Druid!) or Samel the small warrior who has trained me in the arts of war. I would never have taken Igraine as wife and been able to call Arthur my son or Morgause my daughter. Would I change my life if I could? There is a price for every decision so I shall continue to leave mine in the hands of the spirits. What were the worst things about daily life in those times? The times during which I have lived and ruled were hard times. What many like you would find strange is that we share our homes and bodies with a host of fleas, ticks and bugs; but it is not out of choice! Mice and rats are a constant problem in the food stores and in the huts. Violence is a way of life and when someone has become sick, there is a genuine fear that death will follow, we have very little knowledge of the herbs and plants that cure. If we are lucky then the druids would aid us, they have this knowledge, but druids are a fickle people. Oh, and I always hated the mud. Britain has always been a very rainy land which is a reason it is so green and our small crop plantings grow so well, but the mud gets everywhere, so we have become accustomed to being damp and muddy! Tell us something about the druids. I suppose I can tell you some things about druids, having been so close to one cantankerous old druid for so many years. Merlin is a little different from most druids, in that he will have a slightly sensible conversation, but only because it suits his ends. Most druids speak in riddles that just confuse me. They see through the mists of the spirit world, into the shadowland and claim a kinship and have conversations with everything from the trees to the birds. They guide us in many ways and have some strange rituals, but to trying to understand them is a task. The druid council meets high upon the tor on the isle of Avalon, a hill surrounded by marshes and planted with a maze of apple trees. At the top of Avalon is a ring of stones that is their most holy temple. Other stone rings can be found about our land, as well as special groves of trees and deep natural wells that the druids hold most sacred; I have visited many such places with Merlin. They are strange sites that Merlin claims have strong energies connected to the earth, I have felt the strangeness of these places, but I do not claim to understand them. 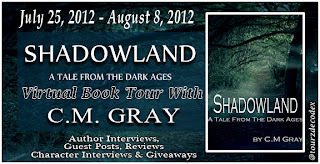 If this sounds like a book you would like to read, be sure to enter the giveaway below. You must be 13 or older to enter. Please only enter once. Thanks! Whodunit? When best friends Darcy and Norah have to create a fake business for a school assignment, they come up with a great idea: a detective agency! Darcy loves mysteries, and Norah likes helping people, so it's a perfect fit. But then their pretend agency gets a real case. Someone is missing, and it's up to Darcy and Norah to take on the search. Unfortunately, there's someone else out there who doesn't want the two detectives stirring up any trouble. . . .With the help of hidden clues, spy gadgets, and trusted friends, can Darcy and Norah crack the case in time? Norah and Darcy's detective agency, Partners in Crime, is taking on a new and chilling case. The girls' classmate, Maya, is hearing strange, crackling voices coming over the baby monitor while she's babysitting late at night. Maya is worried someone might be in danger. 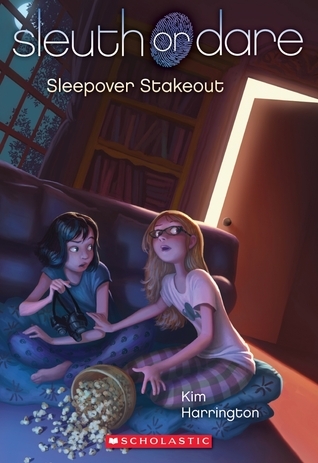 To help investigate, Norah and Darcy join her for a sleepover stakeout. In between eating snacks and watching TV, the girls are on high alert for anything suspicious. Soon, they stumble upon a mysterious secret they never could have imagined -- but Norah and Darcy clash over how to interpret the new clues. Can the girls get past their differences to see their way to the truth? Who's the culprit? 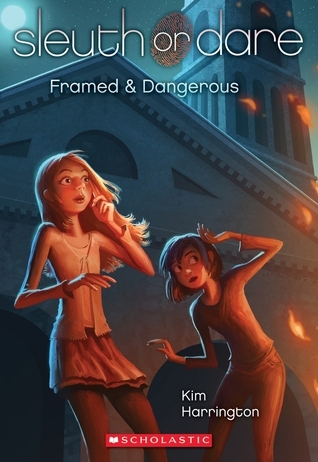 Norah and Darcy are still in a fight, but crime doesn't stop just because the girls aren't speaking. Someone has set fire to their school's brand-new field house. And the prime suspect is Zane Munro, the cute boy Norah can't help crushing on.When Zane asks Partners in Crime for help, Norah and Darcy must band together to investigate. Norah knows Zane is innocent, but the clues are not in his favor. Can she and Darcy mend their friendship, crack the case, and clear Zane's name before it's too late? I'm reviewing these three books together because they go together. Each book is a continuation of the previous ones, which I like. It makes it seem more realistic. Norah and Darcy are best friends. Despite some differences they complement each other nicely. Norah loves astronomy and shrugs off the title of 'nerd' believing that intelligence is something worth sharing. Darcy loves black and purple and crime shows, she also has great skills on the computer that she sometimes misuses. 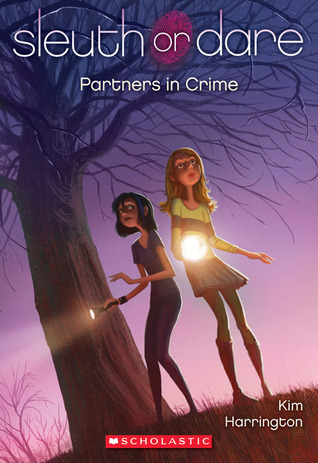 In the first book, Partners in Crime, Norah and Darcy form a pretend business for a class assignment. They are surprised when an anonymous someone seeks their detective help in finding a missing person. They decide to help but first they need to find out the identity of the person seeking their aide. Using Darcy's computer skills and Norah's inescapable logic, can they find the mysterious requester or the missing person? In the second book, Norah and Darcy's friendship is tested when Norah starts spending time with Fiona, the most popular girl in school, and Maya, the quietest girl in school. But the friendship issues take a back seat when Maya comes to them with a problem, mysterious noises are coming out of a baby monitor while she's babysitting. Can they catch the culprit(s) and maintain their friendship? 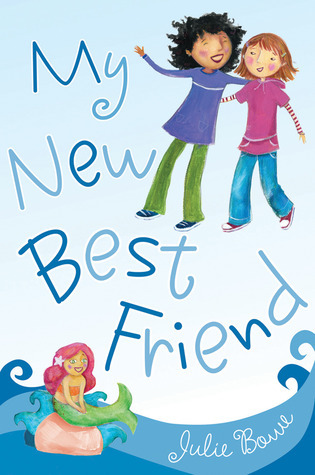 In the third book, Norah and Darcy's friendship seems to be over, but is it? And what about Zane, Norah's crush, did he really burn down the field house or has he been framed as he claims? Can Darcy and Norah stop fighting long enough to find out? This is a delightful new mystery series of special appeal to girls. Not only is the writing good but the stories are interesting and believable. They also involve the technological side of things involving computer hacking, smart phones, and baby monitors. Okay, so baby monitors aren't really high tech, but once you've read book two you might think otherwise. This is a great series to recommend to readers who've moved past Nancy Drew or Hardy Boys or who want a more modern type of mystery. I think this series will really speak to young readers, and I really enjoyed it myself, so much so that I'm giving away a set of the whole series. If interested, fill out the form. Winner will be contacted by email and will have 48 hours to respond. Please only enter once. Thanks. Today and Tuesday, I am highlighting the author Roger Hurn and a couple of his books which I quite enjoyed. Also I hope you enjoy the guest post that Roger has so graciously provided. Roger Hurn is the author of over 70 books for children, including The Mystery Mob series, The Alien Detective Agency and The Spook Squad. He is well known for his author visits to schools and has enormous experience as an educator having taught at all levels from Nursery to Higher Education. His experience led to him being a consultant advisor to the UK Home Office and the Children’s Directorate. Beware of Faery stories. They say that if you kiss a frog you’ll meet a handsome prince. But what if you meet someone who means you harm? Someone who steals children. Someone like the Pied Piper. · Where did the Piper and his apparently magical flute come from? · Why did the Piper keep stealing children? · Where did he take them? · How could he travel through time? So I visited the Isle of Wight to research the background to the legend. I discovered that the French attacked Newtown in 1377, but there were no young men there to fight them off. So, did this lend credence to the story that the Piper had in fact taken the children some years before? Well, probably not. An outbreak of the plague is the more likely explanation for the lack of able bodied young men in the town - but it got me thinking what if the legend had really happened? And what if two of the children had escaped from the Piper’s clutches and reappeared near Newtown today with the Piper in hot pursuit? The questions kept on buzzing round my head and demanding answers. So, in the end, the only way I could find any peace was to write the story. I’m glad I did but it led me into some scary places in the company of some deliciously evil villains – the most terrifying being the mysterious Hooded Lady. She out sinistered the Pied Piper without breaking sweat. Now I’m not someone who is afraid of the dark but, after spending time in her company, I had to sleep with the light on! What happened to the two children who escaped from the Piper’s clutches? Did they make it home safely? And what did happen when the Piper reappeared in our world? 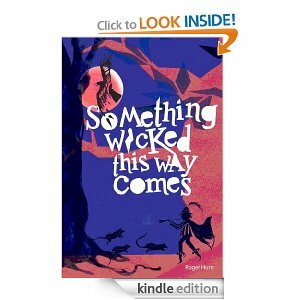 Well, the only way to find out is to read Something Wicked This Way Comes for yourself – if you dare! Reviewed from e-copy downloaded free from Amazon. There are many fairy tale retellings on the market right now. Cinderella and Snow White seem to be especially popular, the new movies coming out doesn't hurt any. But this is the first Pied Piper retelling that I've come across, and it is good. I'm going to try to do this without spoilers because there are some great twists and turns in this story. Ritchie and his sister, Lizzie are stunned when they discover two children in Piper's Wood that seem to have come from the past. That's not possible is it? And yet the clothes the two wear and the way they speak clearly indicate they are not from the area. When Will and Alice realize they haven't returned home like they had hoped, Lizzie is determined to help them, but with the Piper after them, this could be more dangerous than she thinks. When Lizzie and Ritchie find out about the Hooded Lady they become truly freaked out, especially when someone seems to follow them home from the woods. Can they truly help Will and Alice return home? And what about the piper and the Hooded Lady? I have to say that my favorite part of this story was the name-calling fight between Ritchie and Will. Both boys are confident and want to be the leader, they clash from the time they meet. But seriously with insults such as, "Thou mewling, swag-bellied clotpole!" and "you gusset", I had to snicker. I think Will wins that round. Of course, not being British I'm sure that I don't appreciate these insults the way I should. Despite the conflict I enjoyed the way the kids all worked together to try to solve their problems. Sensible Lizza, sweet Alice, stubborn Will, and irritable Ritchie make a pretty formidable combination. Plotwise, just when I thought I knew where the story was going it took a strange twist. Is the stranger following the kids really the piper or is he someone else? What about Madame Sastia at the carnival, can she really see the future? What about Mr. Davies, Lizzie's suddenly new flute instructor, who shows up out of the blue? I better stop there before I give anything away, because I assure you, you will enjoy the magical and dangerous twists and turns that the children face. The only problem I had was when I realized that the ending wasn't really an ending at all, just a pause. I wanted the next book available to read, like now. Be sure to turn in Tuesday for part II to hear about Roger's short story about a group of children in a club called the Lions, who are forced to separate when they are sent from London during the Blitz. Welcome one and all to my Lazy Days of Summer Giveaway! This giveaway hop is being sponsored by Colorimetry & I Am a Reader, Not a Writer. As long as you can order from either place, you can enter! You must be able to use an Amazon or Book depository gift card. Copy received from publisher through NetGalley. There are some books that just seem to speak to me as a reader. This is one of those. There are several reasons for this. First, the story involves a mining disaster in Utah and my grandfather died in a coal mining accident when my father was only nine days old. This left my grandmother with three children to raise on her own. 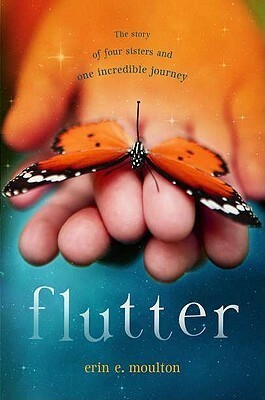 After reading this book, I have a much deeper appreciation for what she must have gone through. Another reason I found this book so compelling was the characters, I fell in love with them immediately. Della's courage and heart in facing her challenges despite relatives who treated her poorly won my heart immediately. How could I not cheer for someone who found much to live for despite her aunt's constant criticism. I also found myself falling for the Winter Quarters community. Despite a place of hard, dangerous work, the people that Della meets find much to rejoice in and they welcome her with open arms. The children that Della works so hard to teach reminded me of everything that I love about teaching and what is truly important about that profession. 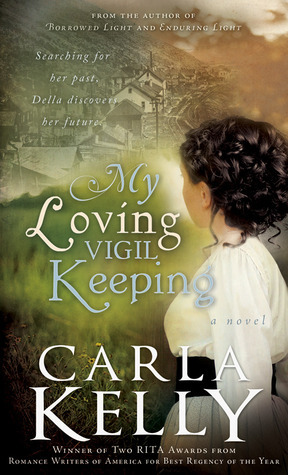 The romance was a very sweet one and also realistic as Della and her love interest struggle with past losses and fears. I especially enjoyed the parts about the choir, so much so that I wished I could actually hear them sing! Religion does play a strong role in the story but not in any way intrusive, at least not in my opinion. I think one of the things I enjoyed the most was the feeling of goodness that radiated from it. 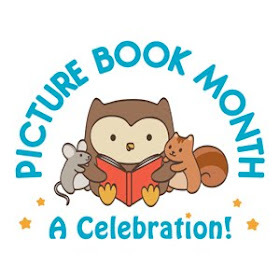 So many books these days are so dark and depressing, but despite the heartache suffered by so many, there was also hope and friendship and love. NOTE: There are a couple of scenes where Della visits a sauna with her Finnish lady friends and they remove all their clothes, but as this is a cultural activity I felt like it fit with the story. 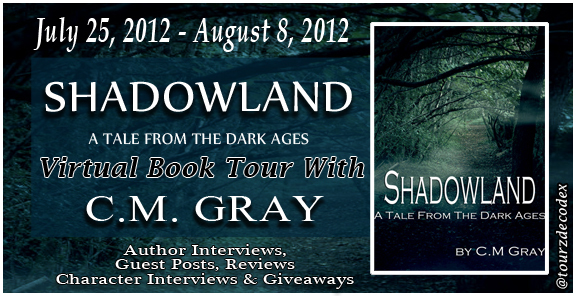 If you are interested in other reviews of the book, see here for the rest of the blog tour. Copy received from author during giveaway. A science-class field trip to the Everglades is supposed to be fun, but Sarah's new at Glades Academy, and her fellow freshmen aren't exactly making her feel welcome. When an opportunity for an unauthorized side trip on an airboat presents itself, it seems like a perfect escape—an afternoon without feeling like a sore thumb. But one simple oversight turns a joyride into a race for survival across the river of grass. Sarah will have to count on her instincts—and a guy she barely knows—if they have any hope of making it back alive. Lost in the River of Grass takes on the classic survival genre using one of the country's most unique wild places as a backdrop. In this tense, character-driven thriller, Sarah must overcome prejudice and the unforgiving wilderness in a struggle to survive. I'm a big fan of survival stories and at its heart that's what this book is, a survival story. But it addresses two different kinds of survival. The first kind of survival is physical survival. Can Sarah and Andy make it out of the Everglades alive? The second kind of survival is emotional/social survival. Sarah, at the beginning of the book, is struggling in her new school. She doesn't have any friends and she feels like an outcast because her family is not well off and she's has a scholarship. 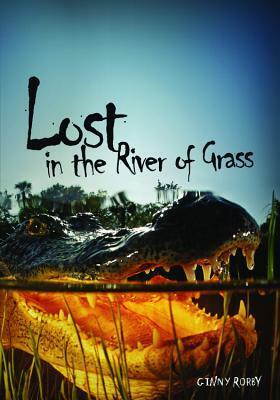 Interestingly in learning to survive in the Everglades, Sarah is also learning how to survive at school. Andy on the other hand, is also facing two kinds of survival, survival in the Everglades, and survival at home. I found it fascinating to watch the two teenagers struggle with both the physical challenges (alligators, lack of food and water, etc.) and the emotional challenges. I thought the way the characters interacted was quite realistic under the circumstances. Andy strives to protect Sarah because he knows its his fault they get stuck in the first place. Sarah is both angry and afraid. The stress of the situation as well as inner turmoil leads both Sarah and Andy to make mistakes. They have several fights and occasions when their desperation leads them to do things that hurt the other. That seemed like real behavior to me. The setting was superbly presented. I could almost feel the mosquitoes and see the alligator holes. The author really places the reader in the environment. The scene with the snake and the alligator felt especially creepy. Plotwise, the story moves along well. I felt like the author did a good job of presenting Sarah at the beginning, which makes sense, since Sarah is telling the story. Andy slowly becomes more understandable as Sarah gets to know him better. Once the two teenagers are stuck, the story really picks up in terms of tension goes. It doesn't really let up until the end. Overall, I'd recommend this book to those who like survival stories with a nice dash of character development. NOTE: there is a moderate amount of swearing and profanity in the book, plus some really intense action as well. Imagine this: For centuries everyone has believed that the sun and all the planets revolve around the earth. But by studying the old books and observing the heavens, you have concluded that the earth and all the other planets revolve around the sun. Your theory is so radical that you are hesitant to tell others about it. Your name is Nicolaus Copernicus. Although at first your beliefs are denounced and ridiculed, your observations are eventually proved correct. In time, you come to be called the founding father of modern astronomy. Or imagine this: It's the early 19th century and women have few legal rights. Married women can't own property, their wages belong to their husbands, and they don't even have the right of guardianship over their children. You know the laws are unfair, but as a young woman yourself, what can you do? Your name is Elizabeth Cady Stanton. You spend your life fighting for women's rights, and later many give you credit for being the architect and founder of the Women's Rights Movement. 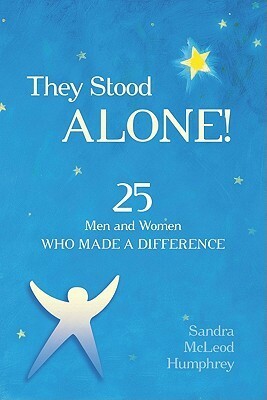 Nicolaus Copernicus and Elizabeth Cady Stanton are just two of the twenty-five extraordinary men and women whom you will have a chance to meet in this inspiring book that explores and celebrates people who had the courage to follow their own convictions, even when everyone around them said they were wrong. They were people of vision who saw life from a new perspective and were willing to question conventional wisdom. And their revolutionary breakthroughs changed and shaped the course of history. There are a growing number of biographies written for children, generally of well-known men and women who've left their mark on the world, for better or worse. Writing biographies for children is challenging because you want to provide enough information so the reader can come to know the subject, but sometimes there are things in the subjects life that aren't really appropriate to share with children. Humphrey does a very nice job of being honest about her subjects without cramming in too much information. I especially appreciated the way she opened each chapter with a quick 'Imagine this' scenario about the subject, without actually naming the person. This is a feature that I plan on using with my fifth grade students. It's a way to get the child reader thinking about the person as a living human being rather than a famous person. The writing is perfect for sharing, not once did I have to go back and say, 'huh' what does that mean. Child readers could read this very easily and get a good picture of the life and times of each person. I also appreciated that the author did not ignore her subjects weaknesses. None of these people were perfect and all of them made mistakes just like the rest of humankind. I also appreciated the fact that the author included people from all over the world from a variety of backgrounds and a variety of cultures, some familiar and some not so familiar. Both women and men are included. I recommend this as a valuable introduction to the biographical format as well as a nice introduction to 25 people who through courage and persistence left a strong legacy. Head on over to Perogies & Gyoza for more great nonfiction recommendations. Summer camp is more fun when you have Friends for Keeps! It's Ida May's first time at sleepaway camp, and her two BFFs, popular Stacey and highly organized Jenna, are also coming along. But when they arrive at camp, their bunkmate is the last person Ida expected to ever see again: Elizabeth Evans, her last best friend who moved away before the start of this series. Ida was heartbroken when Liz didn't answer her letters, and now Liz won't even apologize. All the other girls are ready to welcome Liz back, but Ida just can't be the peacemaker this time. Not until she and Liz talk. Chockablock with fourth-grade wisdom, laughter, jealousies--and apologies--this conclusion to the series is a must read for all Ida May fans. While I love most kinds of middle grade literature, I have a special love of contemporary middle grade. Maybe it's because I work with real kids, but I find a special enjoyment in reading about kids dealing with real problems. 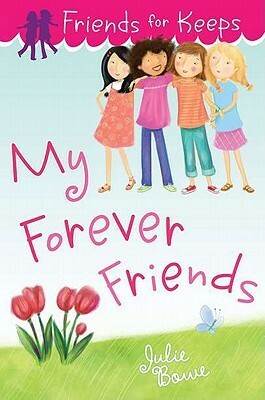 Julie Bowe's Friends for Keeps series does a fabulous job of portraying the ins and outs, ups and downs of friendship. 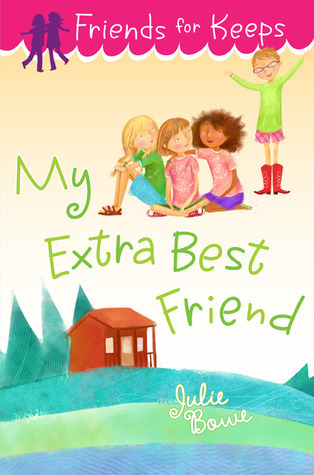 Today I'm highlighting the newest book in the series, My Extra Best Friend, but see below for a quick synopsis of the other four books in the series. While each book stands on its own, it works best to read them in order. That way you have a better understanding of how the various relationships have developed over time. Ida May is thrilled to be heading to camp with her group of friends. They are even going to be in the same cabin. But when Ida May's former best friend turns up as another cabin mate, Ida May is stunned and upset. The ease with which Liz, formerly Elizabeth, seems to fit into Ida's group of friends doesn't make things any easier. Reading this series has taken me back to my own elementary school experiences and the drama of friendships coming and going. Bowe really hits a home run with this series. 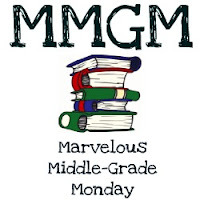 I found myself experiencing the ups and downs of fourth grader Ida May and her friends. In fact, several times I had to stop and remind myself that this was just a story and that I didn't need to get so upset. Maybe it's silly of me to get so involved with characters this way, but I've found some books just do that for me. Maybe I especially connect with this one because I work at an elementary school and I see this stuff going on all the time. And I remember all to well how my own friendships fluctuated a lot during my 4th-7th grade years. This is a series that I am definitely going to be recommending to the girls I work with, I have no doubt that they will relate to it. This series would also be great for read-a-louds, for there is much here to be discussed about friendship, bullying, and the importance of kindness and forgiveness. I highly, highly recommend this series for all middle grade girls! 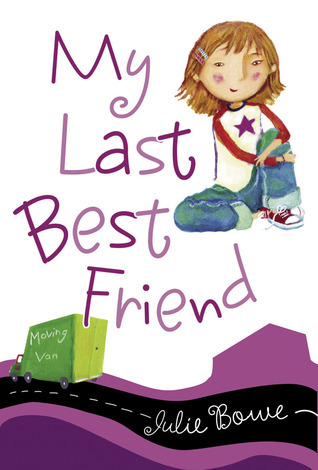 As Ida May begins fourth grade, she is determined never to make another best friend--because her last best friend moved away. This is a doable plan at first. Thanks to bratty, bossy Jenna Drews who hates Ida, no one in class has ever really noticed her before. It's when the sparkly Stacey Merriweather comes to her school that her plan goes awry. Ida reaches out despite her fear, but doesn't say hello—instead she writes Stacey anonymous notes. Soon their friendship develops without Ida ever having to reveal her real identity. Until she has no choice. And that's when the true friendship begins. Ida May finally fits in at school after becoming best friends with Stacey Merriweather, who is universally liked by their classmates. But then Ida?s frenemy, bossy Jenna Drews, brings in a game of truth or dare, and all the girls are suddenly daring one another to misbehave. When Ida finds herself in the principal?s office, she?s scared into ratting out her friends and gets freezed out of the group. The only way she can fix things is to take a triple-dog dare: letting one of the girls pierce her ears. Will her BFF come to her rescue, or is this the perfect job for a frenemy? Packed with fourth-grade jealousies, problems, misbehavior, and consequences, this third book about Ida May stands on its own. Friendships are shifting for Ida May, and all because Jenna and Brooke (former BFFs) are feuding. No one knows what started the fight, but soon the girls in class have taken sides, with Ida May stuck in the middle. Does Ida have what it takes to understand the true nature of Jenna and Brooke's real friendship and figure out the way to bring them, and the rest of the class, together? 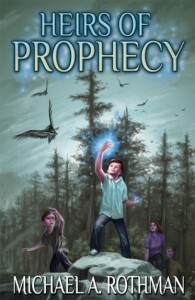 Heirs of Prophecy Giveaway Winner! Thanks to all those who participated in this giveaway. Copy sent by author for review. Vikram, an apathetic kid from California, doesn’t want to be in India. But a death in the family leaves him no other choice. So he finds himself in a rural village, at his ancestral home where he meets his imposing grandfather. A special bond forms between them, and the old man gives Vikram an enchanted seal – a mystical relic from India's earliest civilization. It turns out that the seal is one of only a handful that combine to form the Dharma Cube, the most powerful weapon against evil the world has ever seen. 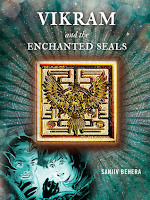 Before Vikram can fully grasp the seal's profound significance, Grandpa is taken by Rakshasas – evil giants from the epic Ramayana – who are intent on destroying the Cube once and for all. Vikram enlists the help of younger brother Jai, and Manu, the family’s loyal servant, to search for Grandpa. Their journey takes them through the various landscapes of India: historical, mythological, artistic, philosophical, and natural. Tension mounts when Vikram realizes that he alone must unlock the secrets of his seal and the Dharma Cube, not just to rescue Grandpa, but to save all of humanity. I have to say that I've never read another book quite like this one. That's one reason I like to read books set in or about other countries, it allows me to learn about other places, people, and cultures. I found myself quite enjoying this one. While I wished for more detail about the characters and especially about the setting, the plot moved along nicely. I found the writing to be decent once I got used to it although there were some strange word combinations, I did not find these to slow the story down overly much. Characterwise, I found the Rakshasas a fascinating kind of monster. I appreciated the fact that the author added some depth to them so that they didn't come across as completely evil or inept, although some of them definitely were. I did wish for more depth in terms of Vikram, his brother Jai, Manu, and Grandpa. I did like the fact that Vikram does grow in the story from a relatively meek and submissive person into a more confident decisive person. But that is about the only real character development in the story. Setting: I enjoyed the setting, the forest, caves, and especially the castle on the island, but I did wish for more detail to help me visualize it a bit more. The different settings did allow me to see the characters in various different settings, with the characters behavior changing depending on where they were. Plot: Where this book shines is in the plot. The book does not waste anytime in getting to the action which I think young readers will especially appreciate, since they generally prefer a good plot to character development. The plot does take some interesting twists and turns, and I have to say that it wasn't predictable, at least not to me. A lot of times in this kind of story, the hero has to save the world by himself. I appreciated that here that wasn't the case, Vikram does play a very key role, but his friends and family help him do so. Overall, I'd say this book is a fascinating different kind of fantasy involving elements of Indian (India) folklore plus plenty of imagination. I would recommend it to those who enjoy a fast-paced story with lots of twists and turns (not to mention great monsters). 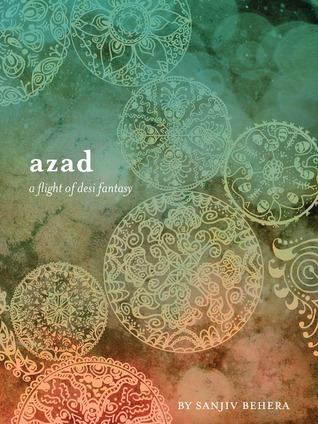 Azad means "liberated" in a number of South Asian languages despite its Arabic roots. In this case, azad is a collection of six short stories linked by Indian mysticism and a common theme of liberation. A street vendor, a young suburban girl, a pudgy athlete, a rebellious tour guide, a goodhearted rickshaw driver, and an earnest wall-street banker, all find their lives dramatically altered by mysterious forces from the Indian subcontinent, changes that free them from the confines of their unique worlds. These short stories are absolutely thought-provoking and unlike anything I've ever read. While only one of the six has what one might call a 'truly' happy ending, that just make the stories feel all that more real. There is a element of fantasy in each story which changes the main characters situation but at the end of each story I was left wondering if the changes were for better or worse. The consequences of choices made and actions taken really makes one think. I doubt there are many people who haven't made a wish about something. What if that wish came true, what might the consequences be? Or how would things in your life change if you simply had more self-confidence? Is is magic or something else? These stories would be great for classroom use because there is much to discuss, in addition to choices, there could be discussions on being true to oneself, culture, family relationships, kindness, and obsession. I recommend this book for all those who want a quick, but thought-provoking read. 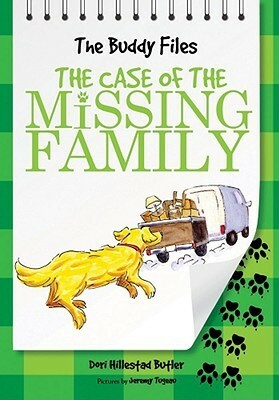 While searching for his mysteriously lost human family, King the dog detective is adopted by another family, who names him Buddy. 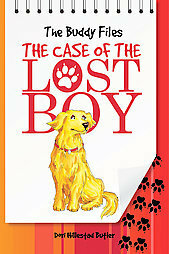 Buddy succeeds in solving the mystery of their missing boy. Buddy wonders what has happened to his first family, but right now he's got another urgent case--two dogs, Muffin and Jazzy, have been switched. How can Buddy get poor Muffin and Jazzy back to their real owners? Buddy has settled in with his adopted family, but he still misses his original people. When he sees a van taking things out of his old home, he decides to make a daring journey to find his original owners. Buddy starts work as a therapy dog at his new family's school, but when the fire alarm is pulled, he must investigate to see who made the false alarm and why. Buddy is in the school library, and kids are taking turns reading with him. While Buddy listens to a ghost story, he hears rustling in the shelves behind him. Something smells strange. Not human, not canine, not like anything Buddy has ever smelled before. Could it be a monster? 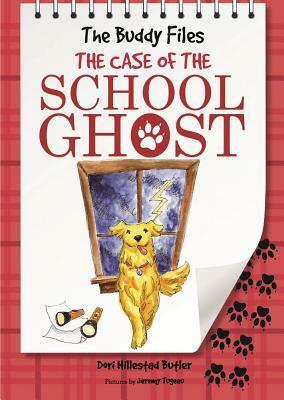 When therapy dog Buddy attends the fourth grade sleepover in the school's library, he solves the mystery of the school ghost. 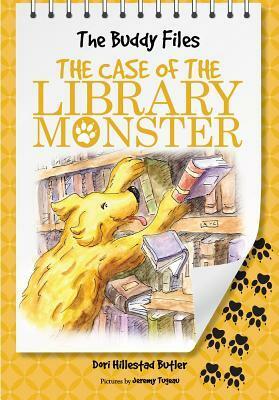 This is a fun early reader series perfect for children interested in dogs and mysteries. Interestingly, the mystery-solver is the dog, Buddy (formerly King). Buddy is the one telling the story and I felt like the author did a great job of sounding like a dog. For example, Buddy loves almost any kind of food, calling it, his favorite food, same with his toys, etc. While the book can be read on its own, it works best to read the mysteries in order because while each mystery is different, the story is one ongoing one. I like the fact that the series functions as one long story, makes it seem more lifelike (not that dogs talking is lifelike, although the dogs can only understand each other, people don't speak dog). There is plenty of action and humor, enough to satisfy a beginning reader. The book is short enough not to be a huge challenge, but long enough to provide a nice mystery. These books would also make great read-a-louds. NOTE: I've read some reviews recently that expressed concerns about some of the content of this book. The first issue is the scene where Connor is supposedly talking to the ghost using a glass jar and a paper with letters on it. This may be of concern to some parents. Since Buddy figures out pretty quickly that Connor is making the glass move it didn't bother me, but it might bother some people. The second concern was about the lies that Connor and his friends tell his mother (the principal). I do agree that that is wrong and should be discussed, also there doesn't seem to be any consequences for these lies, which may bother some readers. 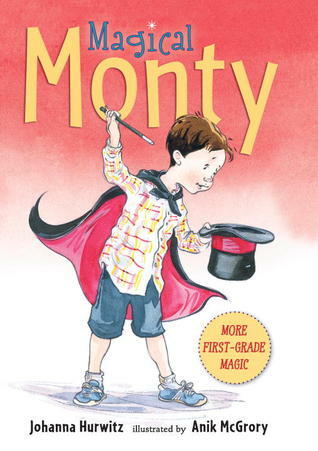 Monty tries to master a magic kit - and finds some real-life situations tricky - in this spot-on story about an endearing, utterly relatable first-grader. First grade is almost over, and Monty will soon be seven. He's now a big brother, too, which makes him feel very grown-up. But when he tries to use the magic set his grandmother gave him, he has a little trouble. Maybe the card trick would work if he were eight years old? Mother's Day is coming, and Monty wishes he had something better to give his mom than the picture frame he made out of ice-cream sticks at school. But how is he supposed to guess from the TV call-in ad how much flowers cost, or that you need a special card to get them? Whether involving his baby sister in his library project, losing a sneaker while marching with his karate class in the parade, or learning that an exciting afternoon isn't always a good thing, Monty's familiar adventures embody the gentle humor of everyday life. Authors who write early chapter books have my undying admiration. It takes special skills to write an interesting story using a small number of words. And yet despite their importance, early chapter books don't receive as much recognition as does middle grade or YA. Here is an example of a great early chapter book series, perfect for reading aloud or for young readers to read themselves, especially for advanced younger readers. Monty is a very appealing young character. He's learned a lot through out his first grade year, but as he nears the end he finds that there is still much to learn, whether adapting to his new sister or figuring out how to perform the magic tricks from the kit his grandmother gave him. Monty is a good kid, who enjoys his new sister. But Monty does face problems, like what to write during silent writing time or how to figure out his new magic tricks. I like how straight forward and believable this story is, perfect as an introduction to contemporary fiction for younger readers. Basically this is a cute series about a cute young boy. I have mixed feelings about this book. I did enjoy it, but as a teacher, there were parts where I wanted to jump into the book and tell the girls not to make such foolish decisions. But as a child reader, I would have devoured this, I still have a strong attraction to survival stories. And while Maple and Dawn do make some foolish decisions, what person doesn't, adult or child? Maple is determined to help her baby sister. After hearing stories for years about the Wise Woman and the spring that supposedly offers miraculous waters, Maple is sure that if she gets some of this water, she can help her struggling sister. Her older sister Dawn is finally convinced to go with her. But within minutes of leaving down the nearby river, Maple and Dawn are in trouble. Unfortunately, some bad decisions (in terms of survival) lead them into more danger when they encounter a pair of poachers willing to do anything to keep their secret. But the girls discover that they are tougher than they ever imagined and thanks to determination and loyalty to each other they find ways to help themselves. There is much in this book worthy of discussion, making this book great for teaching or sharing. NOTE: There is some profanity as well as tense situations. The writing is great, the survival situations believable, and the motivations good if misguided. One thing I thought about here is the power of stories and how vital storytelling is to our lives as humans. It comes so naturally to us that sometimes as adults, especially adults who work with children, we don't stop to think about whether a particular story is appropriate or not. In this case, Maple believes a story she has been told and acting on it, gets herself into trouble. This is a good reminder for me that I need to select stories to share carefully. Reviewed from copy provided for book tour. One man. One Tamping Iron. One medical marvel. Based on a true story, “The Only Living Man With A Hole in His Head” tells the tale of railroad foreman Phineas Gage, whom in 1848, had a three-foot long, inch-and-a-half in diameter, thirteen pound iron rod blast though his skull, taking out part of his brain, and the doctor who treated him and valiantly fought the medical establishment to prove the authenticity and merit of the case as Phineas Gage entered a journey into changed personality, the P.T. Barnum freak show and driving stage coaches in South America. It ended with medical science forever changed. I have always been a history buff and possess my teaching credentials in the social sciences. My mom sent me a newspaper – printed up like an old-time paper from the 19th Century, with stories included from that time. One of the stories was about Phineas Gage and the doctor who had treated him, Dr. John Harlow, who had been ridiculed by his colleagues for his published findings on the case. Like most people, I was vaguely aware of the case, having learned about it in science class – and it was a “Ripley's Believe it or Not” case - but didn't really know the whole story and the aftermath of the accident. The more I researched it, the more I was convinced it would make a gripping “based-on-a-true-story” novel. I read a number of scholarly books on brain science, all of which referenced the Phineas case, psychology, but also, to get the feel of the times right, books and journals on railroads in the 19th century, P.T. Barnum's American Museum, stage coach driving, to name just a few. It was about a full year of research and taing notes before I even began to write the novel. Based on a true story, The Only Living Man presents the account of Phineas Gage and his traumatic brain injury. The book also spends a good deal of time recounting the struggles that Dr. John Harlow, the doctor who treated Gage after his accident, faced in bringing to the world the things he had learned about the human brain from treating Gage. I found both accounts fascinating. I found myself empathizing with Gage and the dramatic changes he was forced to live with after the accident, including changes in personality such as profanity and a seeming inability to judge risks appropriately. On the other hand he seems to have also developed a phenomenal memory as well. The human brain is and has always been a fascinating part of the human experience. This account also includes a clear look at the prejudices and arrogance that we humans cling to so thoroughly, some of us more than others of course. I found it heartbreaking the way that Phineas struggled to find a new life after his old life was so thoroughly shattered. He even worked at P.T. Barnum's American Museum as a 'freak' for a time. Sadly, those with these kind of features are still treated badly much of the time. While I enjoyed the story, there were some problems with this book. The biggest was the clear lack of thorough editing. There were grammatical errors, repetitive words, and long sentences. With a thorough editing the book would be a much more pleasant read. I would also have enjoyed more details about what exactly happened to Gage, although that may simply not be available. Dr. Harlow kept detailed records about his experiences, Gage did not. I did appreciate the epilogue and bibliography that explain where the author got his information, but it does need to be remembered that this is BASED on a real story, which means parts of it are fictionalized, so I wouldn't call this straight nonfiction. Overall, I would say this is an intriguing read for those who can get past the editing issues. Keep in mind that it does contain a moderate amount of swearing and profanity and some rather graphic details about the injuries that Gage endured. One thing I can say for sure, I'm grateful for how far the medical establishment has come in the 150+ years since then, and we owe a debt to Gage and Harlow for helping us learn so much. To bad it came at the cost of so much suffering.